Last week, I was driving the new BMW M5. And at no point did I feel that the 592bhp on offer from its 4.4-litre V8 wasn’t quite adequate. Exactly the opposite: the new all-wheel drive system is so effective at getting that power to the ground, that the M5 becomes absurdly fast. Any more power just wouldn’t be sensible. But the world of aftermarket tuning companies is not a sensible place. Which is precisely why we love it so much. Particularly because it means we get brilliantly mad products like this: the Manhart MH5 700. 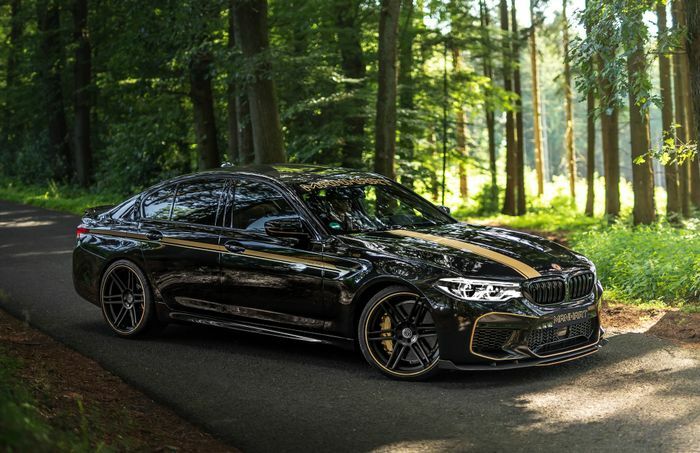 The ladies and gents and the German firm believe that the F90 M5 is “discreet” and that it “lacks drama”. Of course they do. 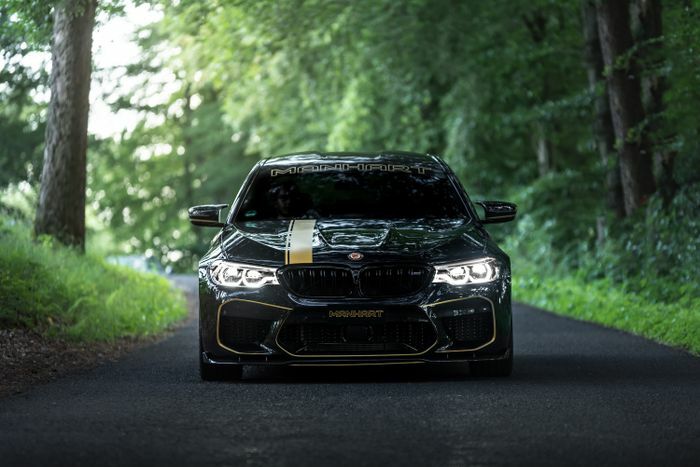 To combat this apparent lack of theatre, Manhart has attached an ‘MHtronik peripheral ECU’, upping the power to 713bhp and the torque to a tarmac-shredding 642lb ft. The only performance figure in the press release is 100-200kmh (62-124mph), which we’re told the MH5 can do in 5.9 seconds. It’s sufficiently fast, in other words. You could just leave it there, but predictably, there are some fantastically unsubtle aesthetic tweaks on the menu. As a kickoff, you can fit a carbonfibre pack that includes a new front splitter, rear diffuser and rear lip spoiler all made from the stuff. The car you see here has also been lowered by 20mm on KW coilovers, and it now sits on 21-inch Manhart ‘Concave One’ wheels finished in satin black with gold accents. The rims - along with the other gold touches on the show car - won’t be to everyone’s tastes, but hopefully, we can all agree that the new exhaust system sounds brilliant. The M5 is already a curious-sounding car, with an exhaust manifold that spaces out the exhaust pulses, making the cross-plane V8 sound like a flat-plane engine. 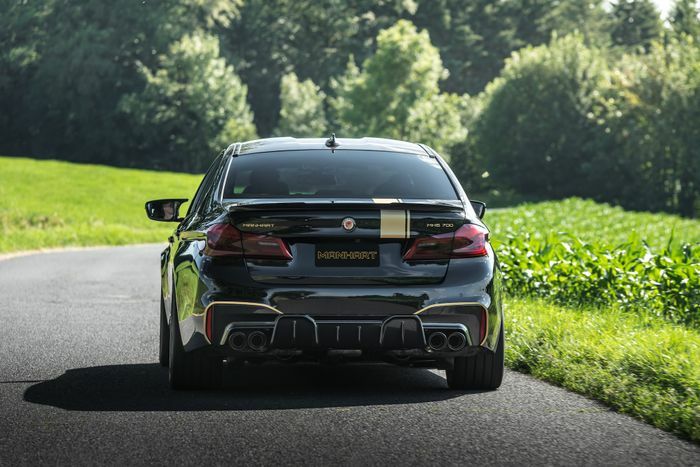 Manhart has shoved its own stainless steel system on the end, featuring 102mm carbon tailpipes, and it’s made the MH5 sound like a McLaren with a hangover. We dig it. 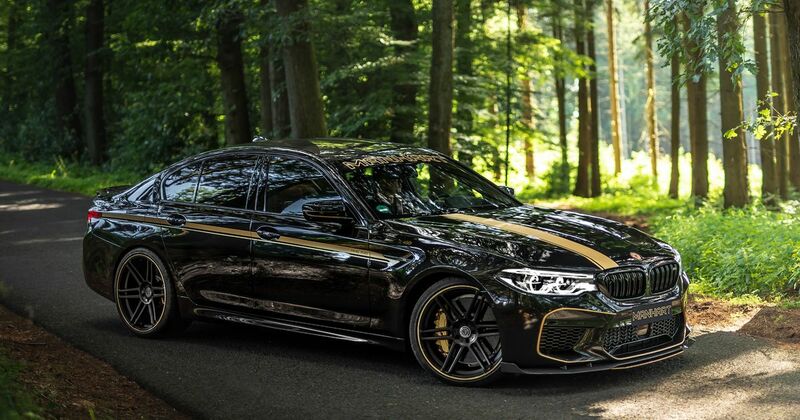 What would you pick from Manhart’s F90 M5 menu? Or would you go for the full shebang? Let us know in the comments.